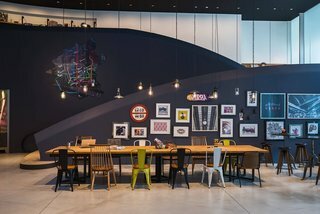 The Moxy hotels are Marriott’s answer to the Aces and Freehands and LINEs of the world, and while the prospect may give pause — what do these ultra-professionals know about the spirit of surprise and fun that animates youth-culture boutique hotels — you can’t really argue with the results. Moxy Osaka Honmachi is everything you want a Japanese boutique hotel to be: equal parts ironic whimsy and serious stylishness, full of up-to-the-minute innovations as well as plentiful respect for tradition. Rooms are fun and funky, stylish and more than a little bit comfortable, with thoughtful details like bedside reading lights and furniture that can be folded up and stashed away. Beds max out at queen size, as space is always at a premium here, but these rooms feel more cozy than cramped. Key to the Moxy’s appeal is the fact that Osaka is one of the world’s great food cities. There’s a buffet breakfast, a bar and lounge serving drinks and international fare, a 24-hour grab-and-go snack bar, and a noodle bar that’s also open around the clock — and that’s just what’s inside the hotel. Step outside and you’re in a neighborhood with no shortage of worthy options — just ask at the front desk and they’ll send you on your way.